A Hummer H2 landed on its roof after a 15-foot fall into the Saxtons River. 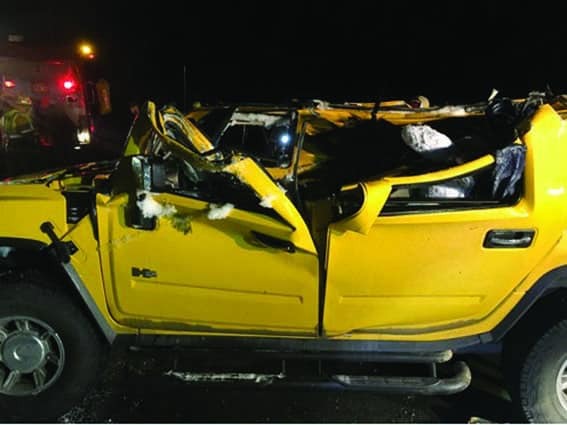 On Feb. 6, 2016, at approximately 8:20 p.m., Vermont State Police responded to a single vehicle crash on Route 121 in Grafton. The vehicle involved was a yellow Hummer H2. The vehicle was operated by Irfan Arif age 17 of of Claremont, N.H. Two juvenile passengers were also in the car. The vehicle lost control traveling west on Route 121 when its passenger-side tires went off the shoulder of the roadway. It then traveled across the opposite lane of travel before entering onto the Saxtons River Bridge. The vehicle struck a guard rail on the bridge, spun out of control, hit the guard rail again then went over the guard rail. The vehicle landed on its roof in the Saxtons River, after an approximately 15-foot fall. The operator and two passengers managed to escape from the vehicle which was partially submerged and proceeded to the roadway where they were found by a passing motorist and later received medical attention.